RC Electric Motors - Choosing the right one! 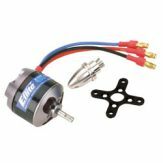 Choosing RC electric motors for your RC airplanes isn't quite as straight forward as ordering the recommended size glow engine. All the different brands, sizes, and specifications can make choosing a motor quite intimidating if you're new to the hobby. Understanding the basic fundamentals outlined here is essential for choosing a suitable motor for your airplane. If you're looking to get into electric flight without having to worry about sizing the components, there are tons of nice and affordable ready to fly electric airplanes on the market. ParkZone is known for their high quality ready to fly models. Hobbico's Nexstar is pictured above is an excellent electric powered ready-to-fly trainer . I personally recommend going with an RTF for your first electric airplane as it gives you hands on experience with the various components of an electric power system. If you're completely new to the hobby, now's a good time to get familiar with the basic components of electric powered RC airplanes. It is also a good idea to have a basic understanding of the difference of brushed vs. brushless rc electric motors. You also need to be fairly familiar with lipo battery packs. You up to speed with motors, batteries and ESC's? Awesome, let's get onto the basic fundamentals and thought process of choosing an RC electric motor for a specific airplane. When shopping for RC electric motors, it's important to understand what all those numbers and specs really mean. Kv is the "Voltage Constant". This is how many RPM's the motor turns for each volt applied. Actually, it's a tad less because motors aren't 100% efficient. For example, if you apply 12volts to a 200Kv motor, it will turn at just under (12 x 200) 2400 RPM's. Kt is the "Torque Constant". For all motors, Kt= 1355/Kv. You'll have to ask someone smarter than me where the 1355 comes from, cause I don't have a clue! Just accept it for what it is. In a nut shell, this means the faster the motor spins for a given voltage (Kv), the lower the output torque will be (Kt). 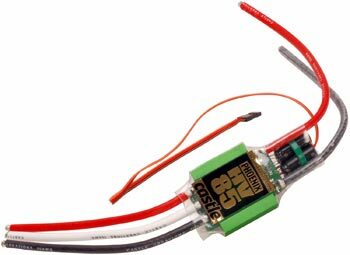 Outrunners brushless motors generally have a lower Kv, which in turn produces more torque at a slower speed for spinning those larger props. The opposite is true with inrunners. Io is the "No Load Current". This is the amount of current it takes to spin the RC electric motor with no prop. For example, if your motor is pulling 25Amps, and the Io is 2Amps, then you really only have 23Amps turning the prop. Rm is the "Terminal Resistance". This is the internal resistance of the motor measured in Ohms. The higher the Rm, the less efficient the motor is. The maximum current and power is what determines how large of a prop and what size plane can be used with the motor. Simply multiply the current by the battery voltage to get power. The larger the propeller's diameter and pitch, the more current the RC electric motor will draw for a given RPM. For example, the 200Kv motor will run at 2400 RPM's regardless of whether it has a 10x6 prop or a 11x5 prop. But, the 11x5 prop will cause the motor to draw more current. Drawing too much current will destroy the motor. The manual for most ARF'S and kits these days make it really easy for you by recommending a specific motor. For marketing purposes, they will obviously recommend the specific brand of RC electric motors that they are affiliated with. If you'd rather use a different brand all you have to do is find another motor with comparable power and KV rating. If you don't have this reference, or are working on a glow to electric conversion, then you'll need to estimate how much power you will need. It is accepted by most in the hobby that 100 Watts/lb is a darn good "estimate" for the power required for an average sports/aerobatic RC airplane. If you plan to fly high alpha 3D maneuvers you'll want to bump that up to maybe 150-200 Watts/lb. You may want to lower this number for a high lift trainer type airplane. But 100 watts/lb is a good starting point if you going at it blind. Nailing down which RC motor to use is only one piece of the puzzle. Equally important is choosing the correct size electronic speed control and battery. Follow the links below for more insight into this endeavor.